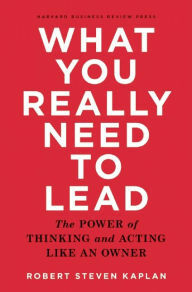 What Kaplan shares in this book is based on wide and deep experience in helping aspiring leaders to think and act like an owner. He is an empiricist and, better yet, a pragmatist, determined to understand what works and what doesn’t, as ewell as why insofar as leadership development is concerned. The primer format works especially well in this book. Thoughtfully, Kaplan includes Appendix A, “Essentials of What You Really Need to Lead,” which reviews the key points made in each of the chapters. “Suggested Follow-Up Steps,” an even more important reader-friendly device, provided at the conclusion of each chapter that also reviews the key points and facilitates active interaction with the material. In addition to highlighting key passages, I recommend having a lined note book near at hand in which to record documentation of “Follow-Up Steps” as well as comments, questions, references, annotations, etc. that are most relevant to the reader’s specific circumstances. There are also several blank pages following biographical information about Kaplan.